I’ve reached the age where there are few surprises under the tree. That’s an observation, not a complaint. One of my gifts this year was an Amazon gift card, which I promptly used to purchase quilting books. Guilt free book buying is a great gift. I like actual paper books about quilting rather than ebooks because the pictures are better. Also, most quilting books are oversize and ebook devices simply can’t show a whole page at a time large enough so I can read it. 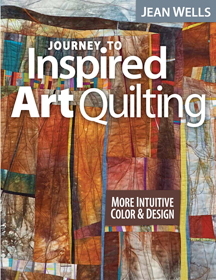 Jean Wells’ latest book, Journey to Inspired Art Quilting, was one of my gifts. I’ve been dipping into it at random and assimilating lessons from it. This books covers many of the topics found in other art quilt books – color, value, design, etc. – but I like the very practical tips and techniques interspersed with the big picture stuff. It’s helpful to find hints about practicalities such as how to sew disparate bits together. (Use coping strips.) It’s not doctrinaire, but full of gentle suggestions and some exercises to get you started. It also has ideas for ways to finish and hang your quilts. I think it’s too easy to fall into the “slap a binding on and you’re done” mindset. I want to try at least one of the assignments – creating a small paper mockup of a landscape photo using colored paper/magazine images. No worries about “wasting” fabric, but a great way to work out colors and their proportion for a project. Too often I stack up fabrics I want to use, but forget that I’ll be using them proportionally. That bright color really won’t be overwhelming if I use just a smidge of it. And the line work assignment gets around any fears about drawing ability by having you trace lines from a photo and then reduce the image to an abstraction. So, thanks to the gift card giver. This book is the next best thing to flying out to Oregon for an in-person class with Jean.